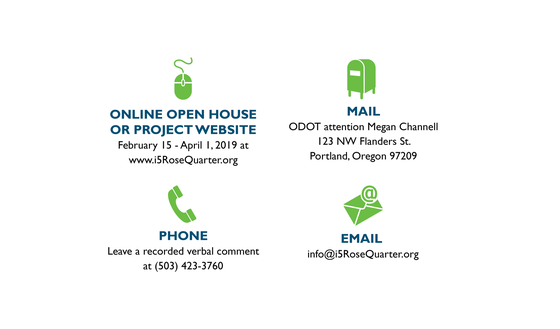 The project is hosting a public hearing where you can provide verbal testimony to project decision makers, following a brief project presentation. Elected officials will comment first, followed by comments from the general public. There are 10 accessible parking spaces on Parking Level 1 (P1) and 11 accessible spaces on Parking Level 2 (P2). Parking Level 2 (P2) includes accessible areas with a 9-foot ceiling clearance to accommodate adapted vehicles. The Oregon Convention Center is located off of Interstate 5 North from Exit 302A-Rose Quarter, or from Interstate 84 West Exit 1-Lloyd Boulevard. The Oregon Convention Center is also easily accessible via Bus Line #6, Portland Streetcar's Central Loop, and MAX. The westbound platform at Convention Center MAX Station (Stop ID 8376) is temporarily closed due to adjacent construction. The eastbound platform (Stop ID 8341) will remain open. During the closure, use nearby westbound MAX platforms at Rose Quarter Transit Center (Stop ID 8377) or NE 7th Ave (Stop ID 8375).